Enjoy our short list of temporary ways to get relief from under eye bags. There are many options floating around as do it yourself fixes for under eye bags. Eye bags are often associated with aging. Currently, the only permanent solution is surgery, but surgery is not always possible. Continue as we explore 4 trends and 1 proven way to get relief from under eye bags. 1. Hemorrhoid cream is considered popular. Hemorrhoid creams are anti-inflammatory by nature. However, several board certified specialists have suggested that long-term use of hemorrhoid creams could make the skin around the eye area worse and can possibly lead to health problems. 2. Spice concoctions, including but not limited to turmeric and cinnamon also fall under popular and holistic approaches. Though, many users have experienced irritation and have had their skin stained orange. 3. Dehydration causes under eye bags and puffiness. If eight glasses of water is too boring then there are several tasty ways to stay hydrated. 4. Simply put, sleep. There is no scientific proof that sleep effects under eye bags, but lack of sleep will definitely impact the severity of your puffiness and can produce dark circles under your eyes. Sleep deprivation can potentially lead to more serious eye health conditions. 5. If you’re busy and in need of something quick and easy, try Plexaderm. Plexaderm visibly reduces under-eye bags in minutes. 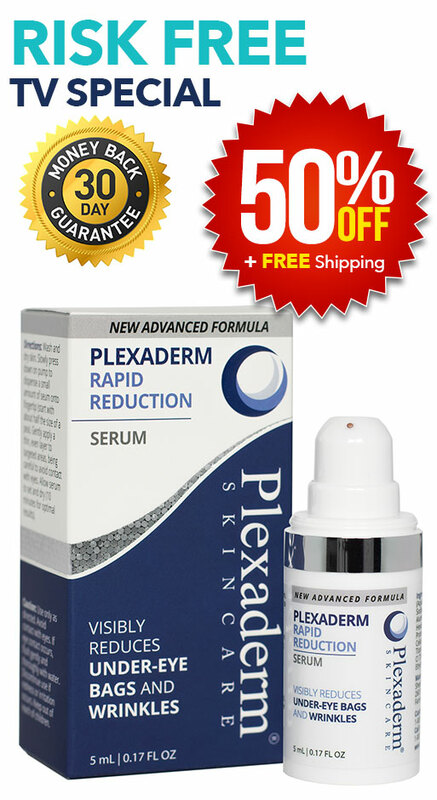 The Plexaderm effects can last up to 8 hours and can be reapplied as needed. Best of all, you can try Plexaderm risk free. You have nothing to lose, except your under-eye bags.